Are you ready for some rock hard abs? 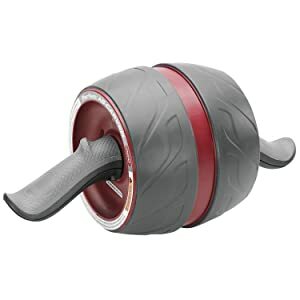 One way to strengthen your core and get your abs back into six pack form is by using an ab roller wheel. What is the Ab Wheel? 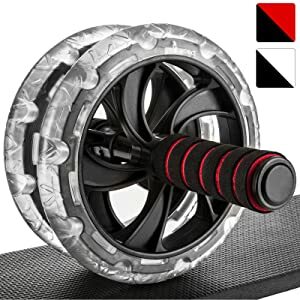 The Ab Wheel, short for abdominal wheel, is an inexpensive (starting under £10) device that basically consists of a set of small wheels with a rod going through the center, extending out creating handles on either side. 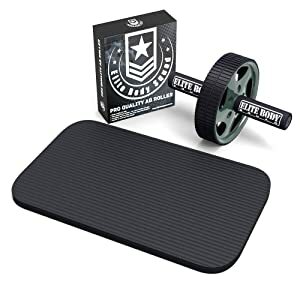 Some ab wheels include foot straps for the handles as well, which allows for additional exercises. The Ab wheel is Not a Device for Beginners: The ab wheel is said to be an advanced way to train the core. 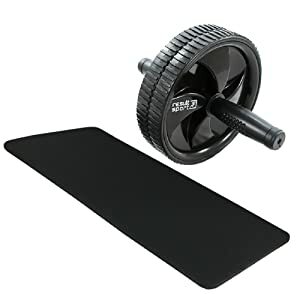 It can be a great device for those to use who already have relatively strong abdominal muscles, good posture, and flexibility, but for a beginner with weak abdominal muscles, use could lead to low back pain, pulled muscles, or even possibly a nice carpet burn from a face-plant. The Ab Wheel DOES Deliver Results: The truth is that it does work! It will flatten and tone abdominal muscles as well as tighten and strengthen the entire core. In addition, the lower back, lats, gluteal muscles, and even the arms and legs will get a workout. Kneeling: (This is the best exercise to start with for beginners). Begin by kneeling on all fours and placing hands on the handles of the abdominal wheel, directly under your shoulders. Tilt pelvis back slightly to help protect your back and squeeze your abdominal muscles. Roll the ab wheel slowly forward, going as far out as you can with control. If you start to sag in the hips or arch your lower back, you have gone too far . Slowly pull the wheel back to the start position, consistently contracting your abdominal muscles. Start easy and work up to 2-3 sets of 10 reps.
Diagonals: Moving diagonally with the ab wheel requires a little more control and manipulation of the wheel than the regular kneeling exercise. It also challenges the oblique muscles on the sides of the abdomen to a greater extent. Begin this exercise the same way as the kneeling exercise except as you begin to roll the wheel forward, steer a little to the left, towards 10 o’clock. Pull the wheel back to the start position. This next time steer a little to the right, towards 2 o’clock. Alternate from side to side for 5-10 repetitions. Leg Roll-Ins: (This exercise requires use of the foot straps) Start by placing feet inside foot straps. Place hands on the floor in front of you so that you are in push-up position. Maintaining straight legs, lift your hips up as high as you can in the air and hold briefly at the top. With control, lower back down to the starting position maintaining tightness through the abdominal muscles. Avoid allowing the lower back to sag at the bottom. Start slow and work up to 2-3 sets of 10 repetitions.Variation: For an easier version of leg roll-ins, you can also perform this exercise by pulling the knees in towards the chest by bending your knees, rather than keeping them straight. Standing: Once your abdominal muscles have adjusted to using the ab wheel, you may be ready to try the wheel from the standing position. 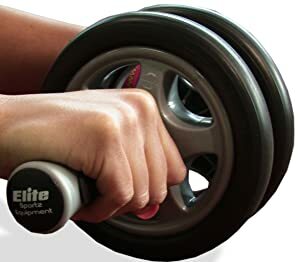 Start by bending at the waist and grabbing hold of the ab roller wheel handles. While contracting your abdomen and tilting your pelvis backward, with control, roll out until your body is in a plank position. Slowly roll back to the starting position. Listen to your body to determine number of sets and reps to be performed. 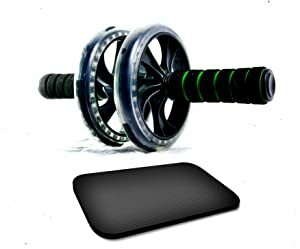 What Can We Conclude About the Ab Wheel? 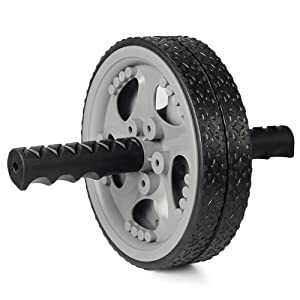 While there is some risk associated with use of the ab wheel, especially for beginners, there is no doubt, the ab wheel results in phenomenal abdominal muscle tone and strength. 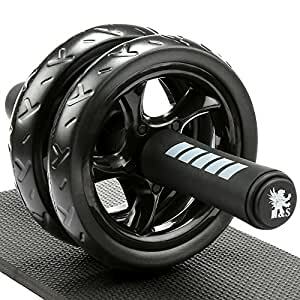 For those who already have some core strength and flexibility, adding an ab wheel workout to your fitness program will definitely get you moving towards the long sought after washboard stomach. 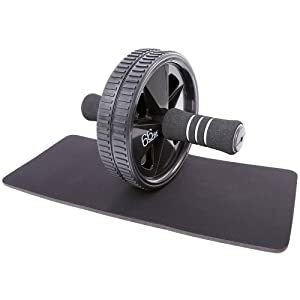 And the best part, it’s inexpensive, provides an intense workout in a short time, and you can do it right in the comfort of your own home. So, take it slowly, listen to your body, and get rolling your way to some great abs with the ab wheel.